A couple of months ago, I decided to set up a family command center for the first time ever. I realized something had to be done when I upset the stack of random papers on the kitchen counter on my way out the door. I was running late for my appointment because I was so busy picking everything up, and while I was doing it, I noticed an overdue bill and a letter I never responded to. And then it dawned on me halfway to my appointment that my son’s dental appointment was scheduled an hour later. I had to cancel my appointment to go pick him up and take him to his. Clearly my system for bills, mail, and scheduling was not working. I didn’t even really have a system. 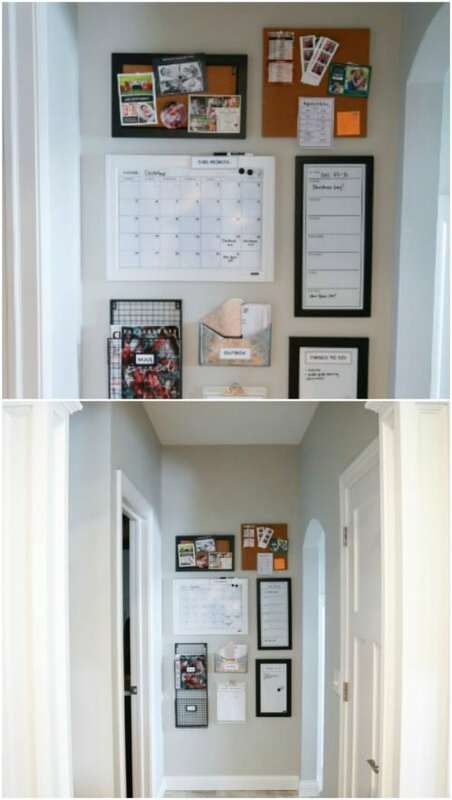 So I started looking up ideas online to get everything organized all in one place, and I ended up finding a ton of fabulous ideas for family command centers! If you don’t have a family command center, what you have is a mess. Just keeping one part of your household running smoothly, let alone your entire household, can be next to impossible. And household members are rarely on the same page with one another. Put an end to scheduling conflicts. Keep chores, shopping, bills, schoolwork, and mail organized. Tidy up the appearance of your home. Bring your family closer together through notes, artwork, and more. This is a place to celebrate what makes your family special and unique! Ready to get started? The following 50 family command center ideas should provide you with plenty of inspiration for your own! 1. Make use of your wall space. 2. Make pretty file folders to personalize your family command center. 3. Sometimes simplicity is all you need. 4. Make use of a small empty wall. 5. Make use of cute baskets. 6. Black and white makes for a nice clean look. 8. 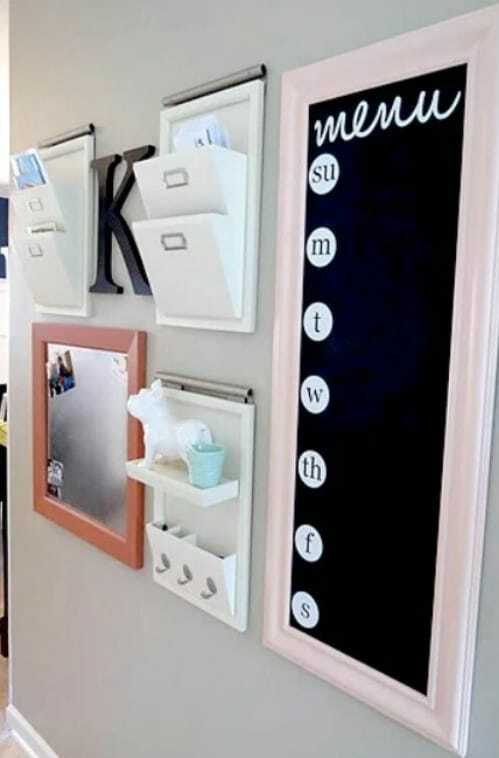 Craft a wall organizer with a chalkboard. 9. 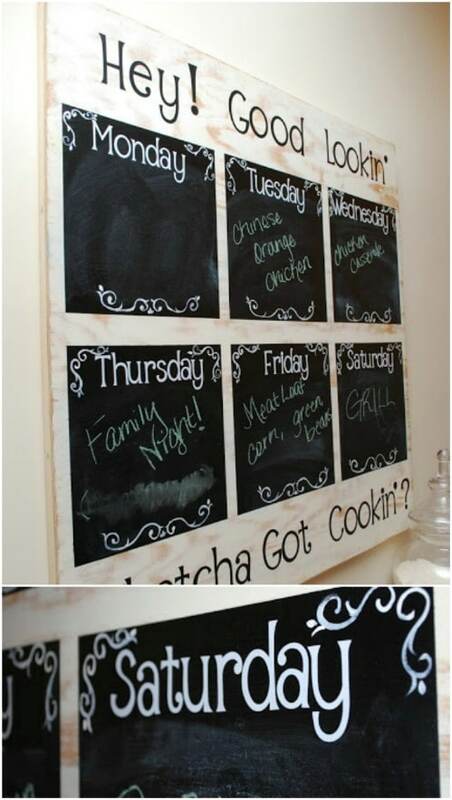 Use a chalkboard for a calendar. 10. 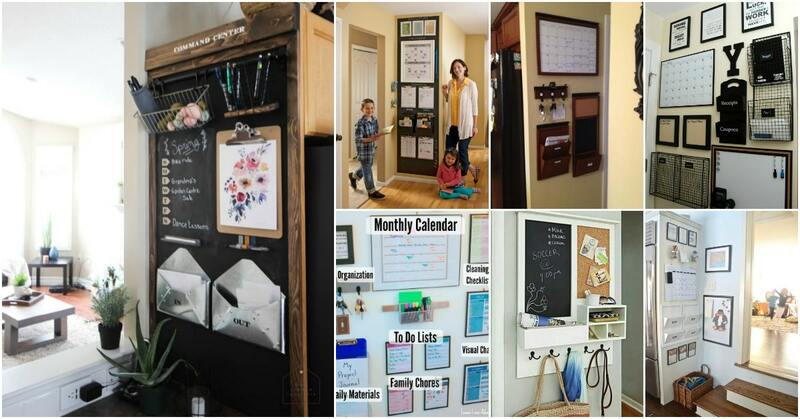 Create a budget-friendly family command center. 11. Hide your family command center inside a cabinet. 13. Use pastel tones for a softer look. 14. Go for an industrial look and feel. 15. 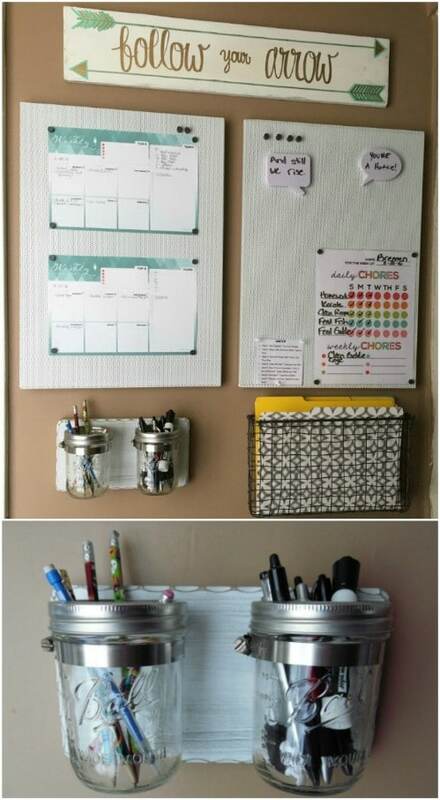 Use magnet boards and dry erase boards to get organized. 16. Go for a rustic look. 19. Never gift up looking for ways to beautify and streamline your command center. 20. Keep everything neatly aligned for a clean look. 21. Here is an upgrade to the command center above. 22. Here is an elegant, minimal command center. 23. Build a command center in your mudroom. 24. Here is a command center with a neat, simple look. 25. 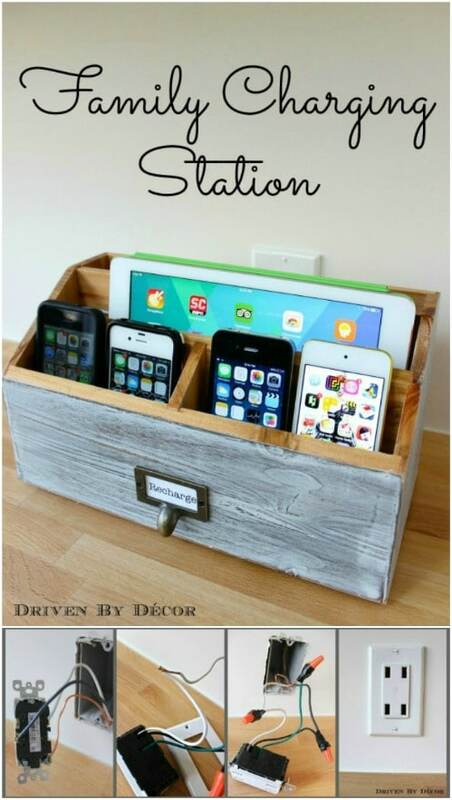 Make a charging station for your entire family. 27. Here is how to create a customized message board. 28. Add some fun personal embellishments. 29. This command center uses bright, beautiful colors to create a cheerful look. 30. Put your family command center in a corner. 31. Keep it cute and simple. 34. 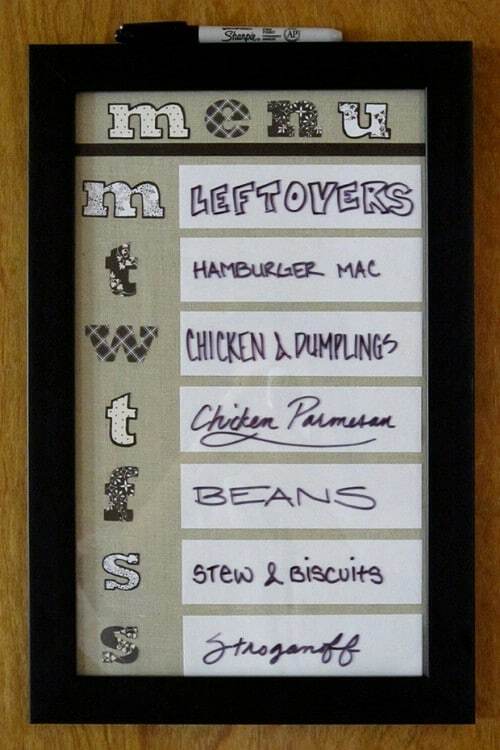 Here is an idea for organizing your food calendar. 36. Wood makes for a classy, elegant look. 37. Follow this simple how-to guide to get started with your own command center. 38. Create a magnetic menu board. 39. Don’t forget to make good use of chalkboard paint. 40. Here is one more menu idea you can integrate into your command center. 41. 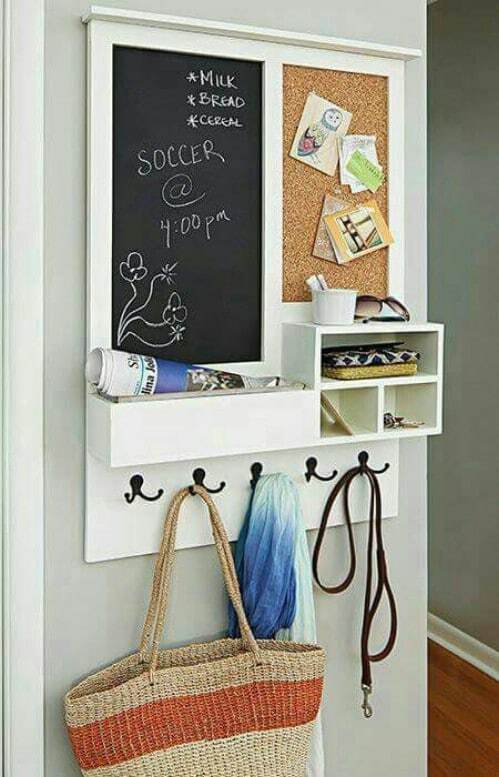 Check out one more beautiful chalkboard organizer. 42. Here is all the stuff you might want to include in your family command center. 43. 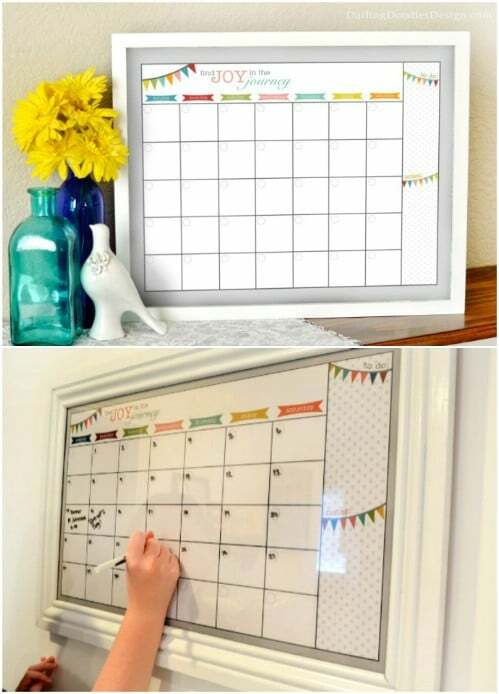 Build a dry erase calendar. 44. A few pops of color in an otherwise monochromatic system can have a beautiful effect. 45. Everything can stand out against the right backdrop color. 46. Here is another beautifully inspiring command center design. 48. Use super high contrast to make your calendar or menu stand out. 49. 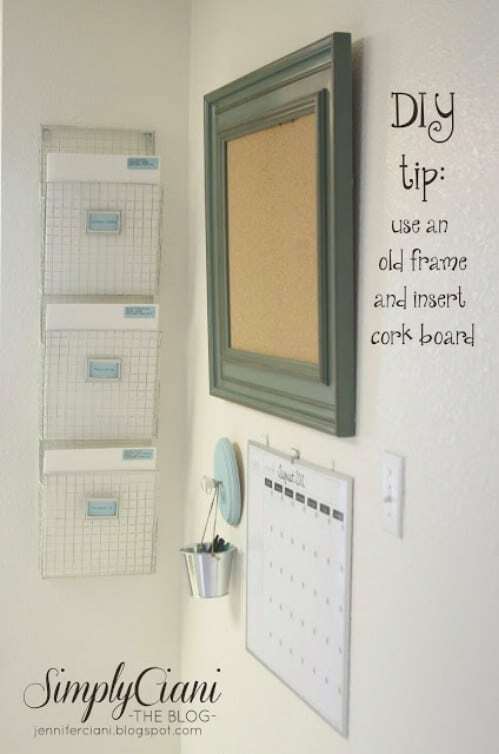 Insert corkboard into an old frame. 50. 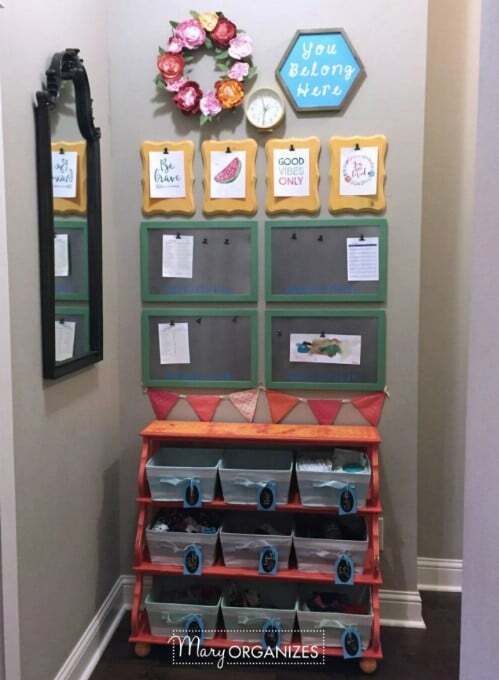 Build your own front entrance command center with free printable plans. 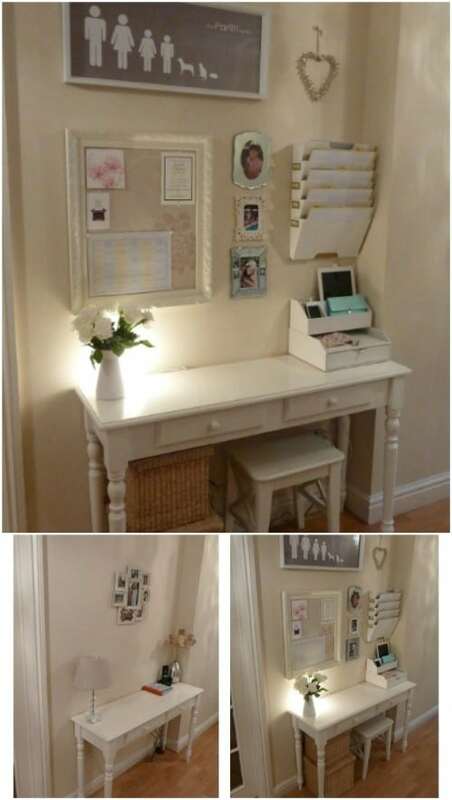 This is a great example of a family command center which makes use of very little in the way of desk space. Almost the entirety of the system is on the wall—there is even a cute little key holder on the wall! Notice the bright colors and the personal touches. One wonderful way to spruce up a family command center is by creating beautiful customized folders for organizing. Click on the source link to find out how you can do it using plain old manila folders and contact paper. This family command center is entirely on the wall, and it is also entirely self-contained. As you can see, it is incredibly simple and minimal. But sometimes that is exactly what you need. You do not necessarily have to have everything in one place. Here you can quickly and easily check notes and grab what you need as you are going in or out of the house. This command center spans from floor to ceiling. But what really impresses me about it is its location. It is on a narrow bit of wall which most people would simply ignore. It just goes to show, there is no such thing as unusable space. From a visual perspective, you’ve gotta love this command center. It’s got a lot of style. Aren’t those baskets adorable? And check out those custom labels she made … wow! Who says you always need to go with the bright and colorful look? Sometimes a monochromatic command center with high contrasts yields a bold, stunning effect. Plus, it certainly looks neat and organized! There is nothing here to distract you. The sign above this pin board that says “Simplify” says it all. Is this a full-fledged command center to take care of all of your organizational needs? No, but it makes for a great bulletin board. If that is all you need, it would work great on its own. Otherwise, you could integrate it with a more comprehensive family command center. Find a tutorial at the source link. 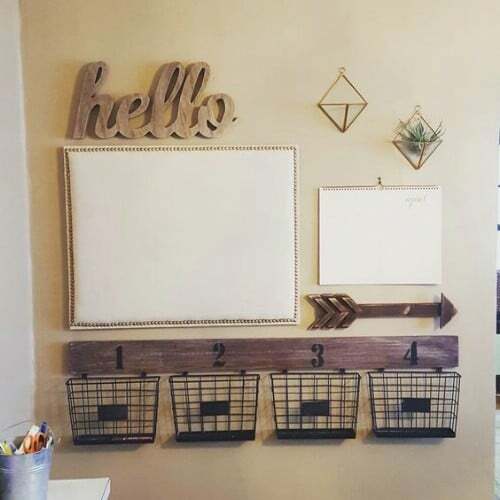 Here is a beautiful handcrafted wall organizer with a chalkboard incorporated. There is a place to hang your keys, and enough room for incoming and outgoing mail along with a few additional items. The chalkboard could be used for messages, but a cute design is a great idea too! This command center shows an excellent use of a chalkboard to write out a weekly calendar. The letters denoting the weekdays are permanent, but you can erase and rewrite a new schedule every week. The envelopes for incoming and outgoing mail are also cute and simple. 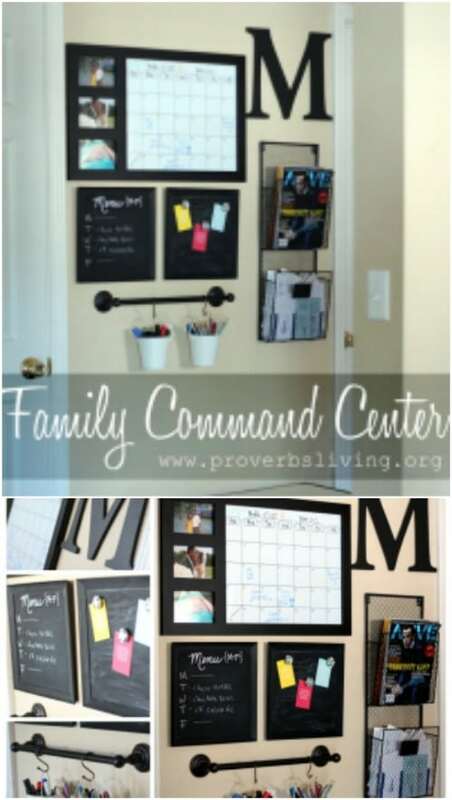 Need to create a comprehensive family command center, but on a tight budget? Visit the Simple As That blog to learn some great ideas for getting your family organized on a shoestring. 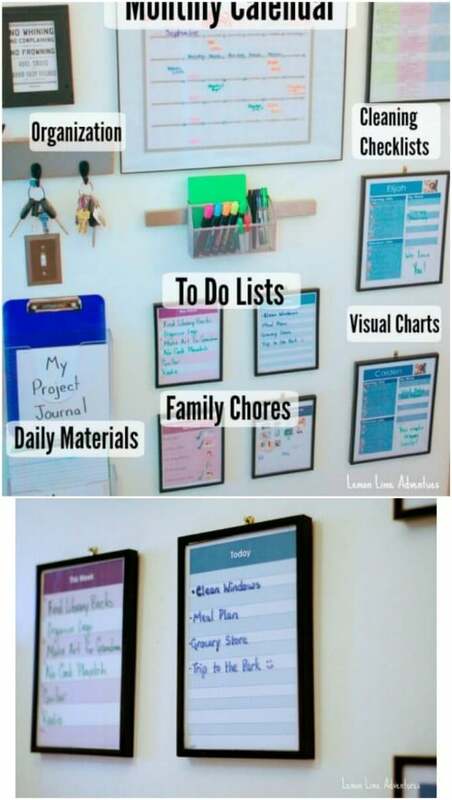 This is a brilliant idea if you think that a family command center looks cluttered (no matter how organized it is, you still might not want to see scheduling, papers and the like). It is also a genius plan for making use of what little space you have if you live in a tiny house or apartment. This is not an idea for a full command center, but it is a really cool idea for a message board which you could integrate with one. A piece of glass has been painted a vibrant spring green. Dry erase markers can be used to write on the glass. “Family command center” … it has a rather harsh military sound to it, doesn’t it? It makes you picture something on a battleship. Well, for a softer look and feel, consider using lovely pastel shades like this talented DIYer. Out of all the command centers I have seen, this one stands out from an aesthetic point of view. Here we have a chalkboard command center with some simple metal containers painted with industrial type. I love the beautiful simplicity of this system as well as the unique ambiance it creates. Here is a great image which spells out exactly what you are looking at. I really like the inclusion of the magnet board! What a smart idea. It’s well worth clicking on the source link to check out other photos of this family command center. The original source link on this one unfortunately seems to be broken, though it was posted on a site called Post Road Vintage. Everything about this command center is stylish, homey, and inviting! 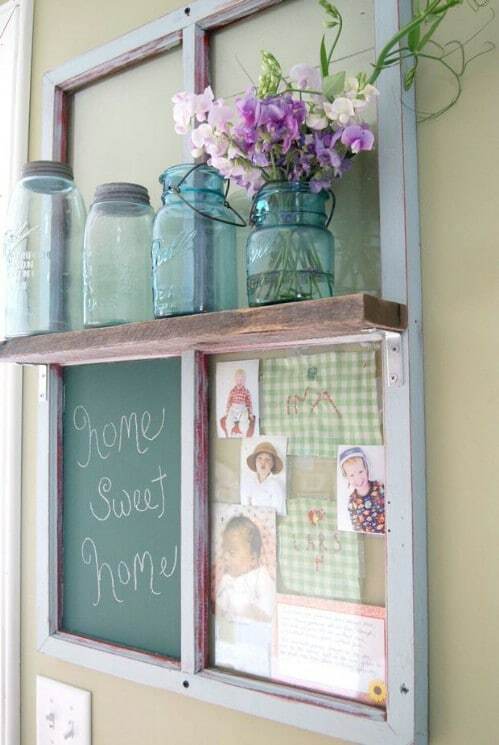 The mason jars, the flowers, the old-fashioned blackboard and the window frame with the distressed wood all combine for a lovely effect. 17. Learn how to build your own message system. At the source link, you can view a detailed tutorial which teaches you how to build a message system like this. This particular example measures 30 x 22 inches. You can hang it up wherever you want—on a wall or a door. It would be easy to move if you ever decide to rearrange—very cool! 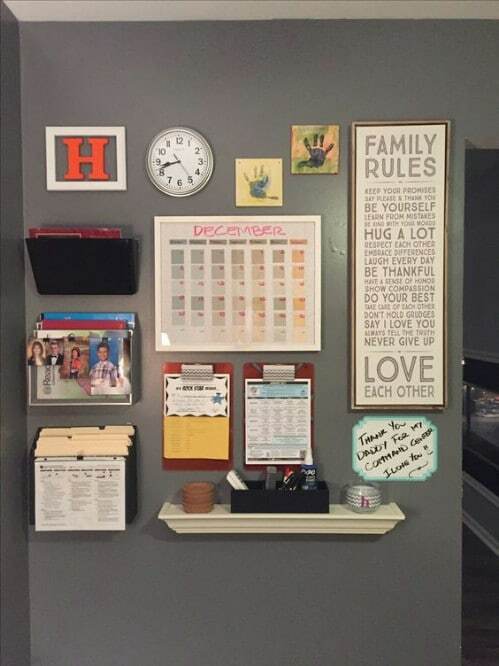 Previously I shared a great family command center which took advantage of a small, unused section of wall. Here is another one which does the same thing. 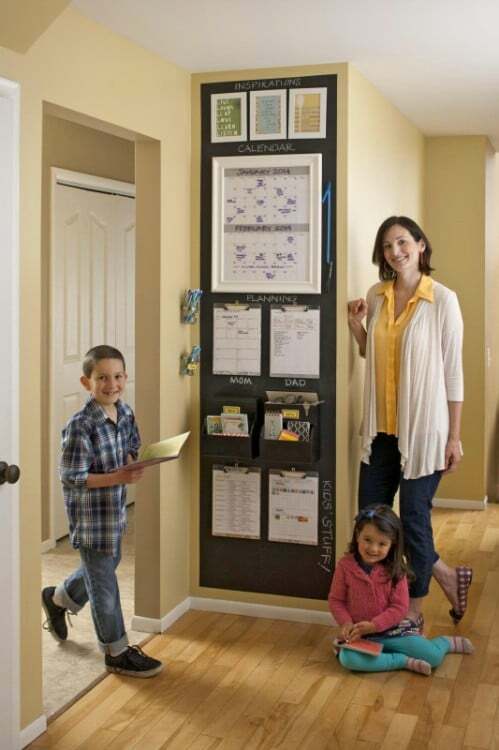 Running from top to bottom, it offers a great way for family members to stay connected and organized, and it looks fantastic. Check the link for a tutorial. Here you can see a “before” and “after” for an upgraded command center. The original command center had some functionality, but it was probably pretty limited—and it certainly was not pretty to look at. 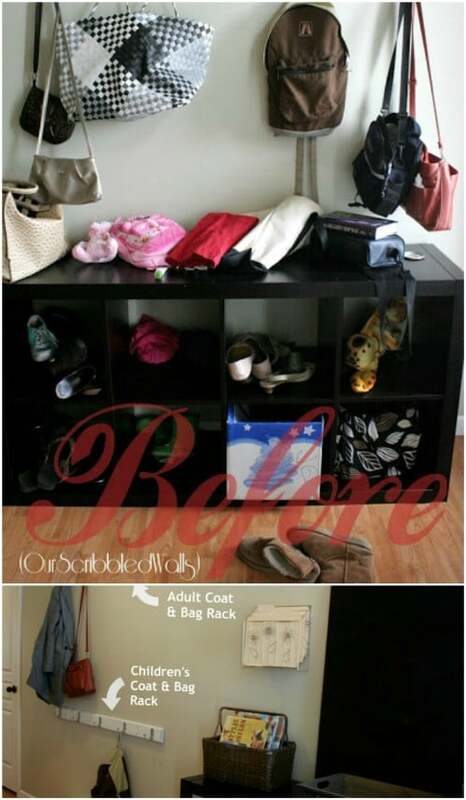 The “after” photo is a world away from the “before” photo—it looks incredible! There are two things that grab me about this particular command center. The first is that everything has been neatly lined up in an obvious grid, and this gives everything a tidy appearance. The second is the dark backdrop, which brings contrast to the entire zone, helping you instantly see where everything is. Getting déjà vu looking at this image? That is because this is the exact same wall that was featured above! This is the updated version of it. Check the source link to visit the blog and find out more about the changes. As you can see, the neat grid has been abandoned to some extent, but the dark backdrop and high contrast remains. 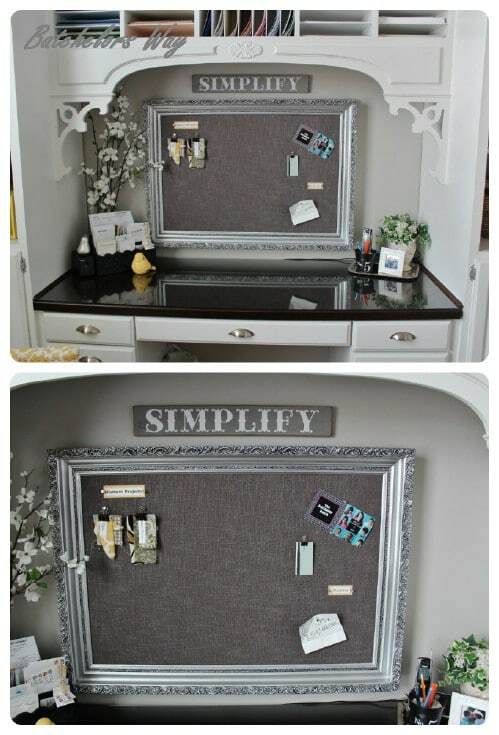 There is not a whole lot to this command center—just a couple of wire bins, a corkboard, and a calendar along with a strip of blackboard. But do you really need more than this? Perhaps not! Have you noticed that a lot of the featured command centers in this list are in the kitchen? Don’t forget that there are other areas of your home which are also convenient for your family command center—like your mudroom! 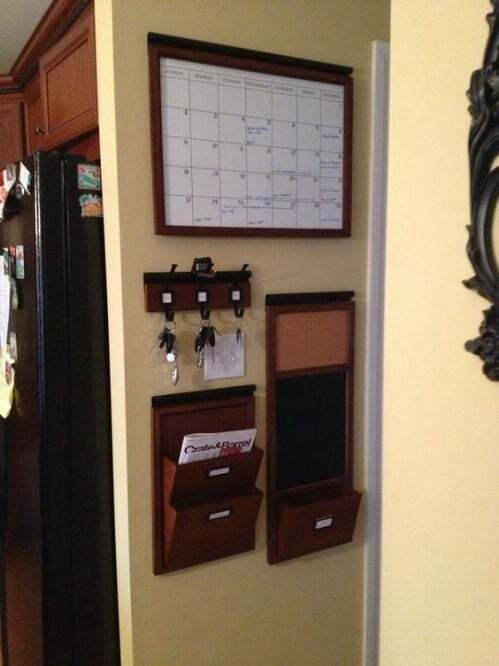 Here is a great photo of a mudroom command center which tells you what everything is—very helpful for planning your own command center. Some command centers are designed with bold colors or high contrast to help them stand out—but this one seems to me like it was built to blend in. And you know what? It does so beautifully. Have a bunch of electronic gadgets strewn around your command center? Get those smartphones, tablets, and mp3 players in order, and charge them while you’re at it! The source link teaches you everything you need to know to build a charging station for all your family’s devices. There are a few things about this command center that I really like. The soft design elements, the neutral tones, and the adorable Parfitt family artwork at the top are all awesome. But what I want to point out is the light! A lot of command centers seem to have no lighting solution whatsoever. This one does, so it would serve you just as well in the middle of the night as it would during the daytime. At the source link, you can view a tutorial which teaches you how you can create your own unique customized message board. One brilliant idea that went into this project is the use of personalized fabric. Check it out. What instantly draws the eye with this command center is the big letter “M,” which presumably stands for its designer’s last name, Mclain. Visually it really makes the entire design stand out, and it is a great homage to the family. This command center is just beautiful to look at, isn’t it? If you check the source link, you will find a lot of great advice regarding different functional and stylistic elements. Here is a corner desk with a command center spread across two walls. 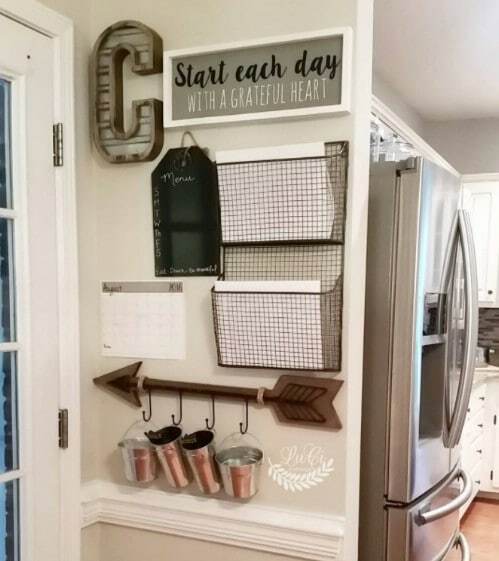 The design element that really stands out here is the cute set of clipboards at the top with the chalkboard prints on them. What an adorable command center this is! Every element has a touch of rustic style to it. The “hello” sign and the little wooden arrow are so cute, and check out that tiny plant in the diamond-shaped holder. 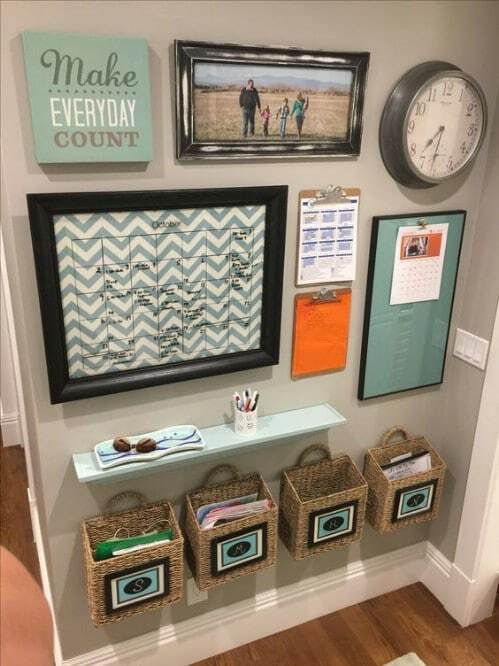 This is a lovely command center, but what I really like about it is the sign that says “Make everyday count.” I especially like that it says everyday, not “every day.” Why? This sign emphasizes that it isn’t just each day that you should remember to value, but the simple wonder of everyday life. And that is what building a command center is all about—organizing and celebrating the more mundane aspects of running a home. 33. Here is another rustic command center. Check it out—here is another rustic command center which incorporates a wooden arrow. Those seem to be quite popular right now. Notice that the hooks give it a purpose which is at once stylish and functional. If you use your family command center to help you plan your meals for the rest of the week, here is a brilliant way to do it! This saves you from having to write everything out each week. Just switch the cards out as you need to. This menu system makes use of a clear piece of glass and a sharpie. It looks super cool of course, but what I want to draw your attention to is the way each day is written in a different font. This would take some time and effort, but it has two immediate benefits. The first is that it is cute to look at, and the second is that it is functionally easier to read in some ways. Each day stands out. This command center stands out. The uniqueness of the setup seems to come from the material which was used—lots of wood. There is no weathered, timeworn look to this wood either; it isn’t a rustic command center. Instead, it looks classy, modern and sophisticated. This is such a clean, professional look it’d be great even in an office. At the source link, you’ll find a nice, quick tutorial on how to set up a command center of your own. Need more space and detail for your menu planning? Want to be able to plan out a month of meals at a time? 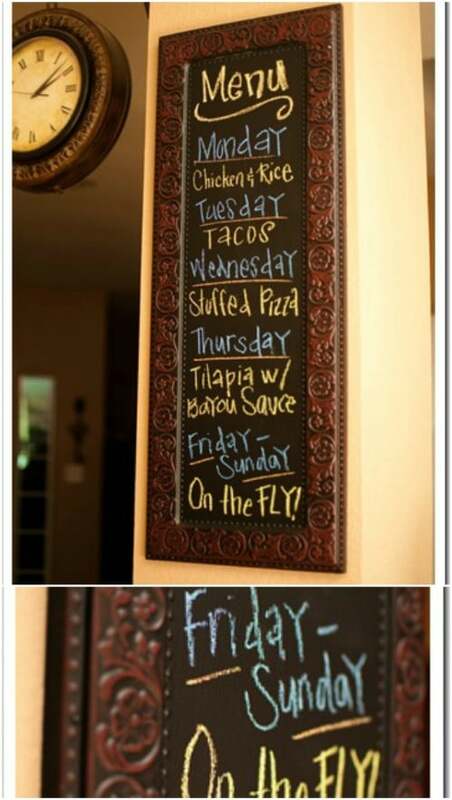 One great way to do it is by making a magnetic menu board and coming up with a simple system of codes to help you plan. Check out the link. I’ll get back to showing off full command centers in just a bit, but I wanted to share one more menu planning idea. Don’t forget that sometimes the simplest solutions are the best ones—like chalkboard paint! This menu organizing system involves clothespins and meals on pieces of paper which you can change in and out. Aren’t the clothespins cute? Visit the link below for free printables. 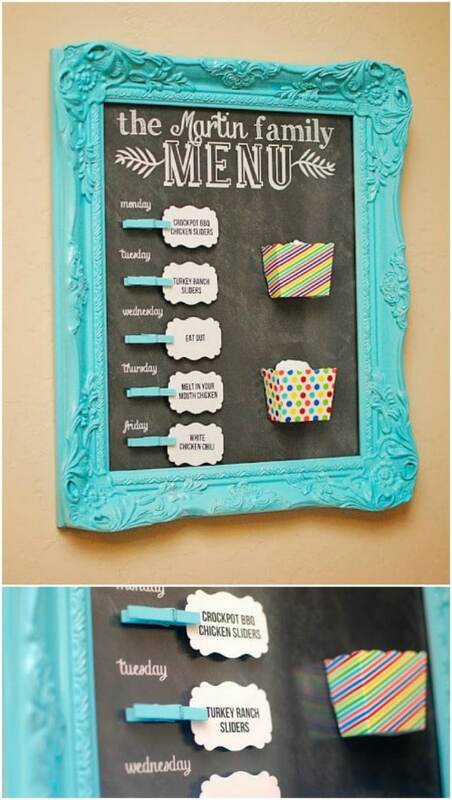 This chalkboard organizer is being used for menu planning for the week, but it occurs to me that it would also work well for organizing family chores or even just recording everyone’s schedules for the week. By now you have had a chance to see just how much variation there is from one command center to the next in terms of what is included. If you are having a hard time figuring out what you need for yours, here is a checklist to help you plan. 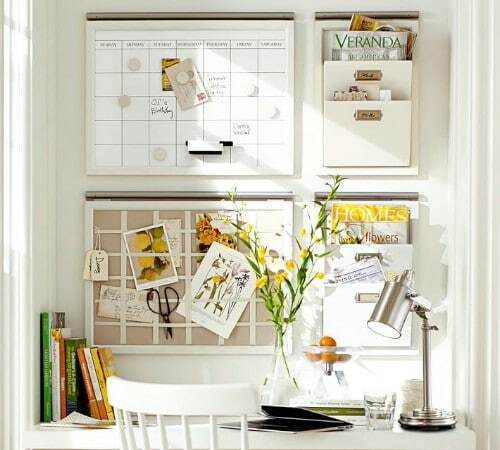 A simple dry erase board in a pretty frame can work great as a calendar in your command center. If you follow the source link, you’ll see that the DIYer who created this one has the template for sale on Etsy. For the most part, this system blends right into the wall, but a few splotches of bright, cheery yellow give it an inviting, homey feel. Perhaps all the walls in this house are gray (it looks that way). In any case, the gray offsets everything in this command center beautifully. So if you are setting up a command center on a small section of wall, you might even want to consider painting the wall first. There are no unique ideas here I have not already showcased earlier in the list, but it’s such a lovely command center I had to show it off. 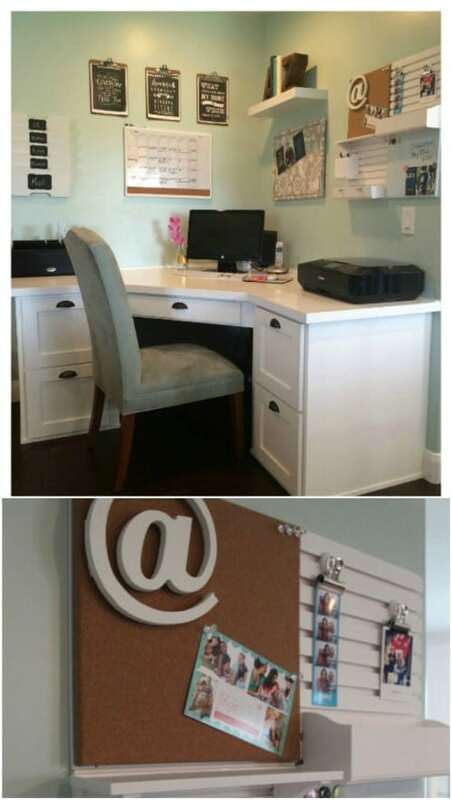 The blogger who created this command center talks about how much thought she put into the “Follow your arrow” sign. This is a great reminder that your command center is there not just to organize, but to inspire! The original post is gone, but the image has been saved by One Good Thing by Jillee. The menu instantly demands attention because of the high contrast colors. Very nice! Check the post to see Jillee’s command center and some others she has collected as well. The lovely, simple clean look of this command center is commendable. 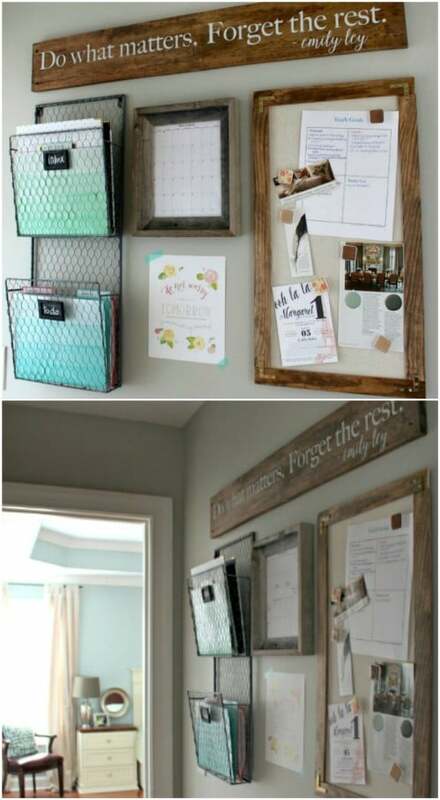 An otherwise plain corkboard really looks beautiful when inserted into an old painted frame. This is an easy way to make your command center look more homey or rustic. 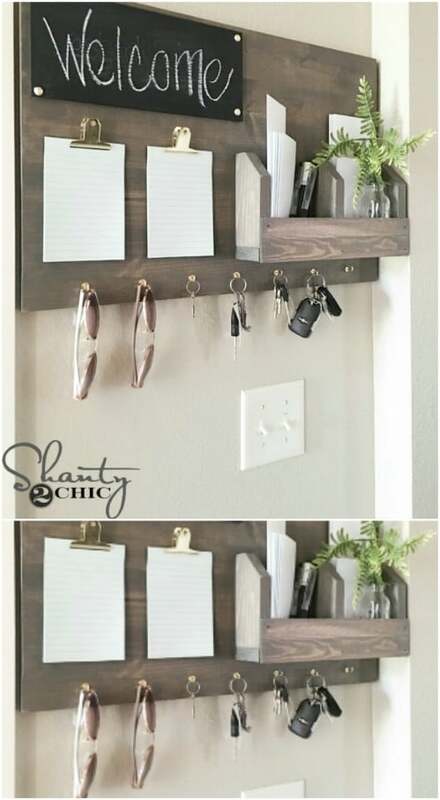 You can always depend on the talented ladies at Shanty 2 Chic to come up with a brilliant tutorial for any project—including a command center! Check out the video and download the free printable plans at the source link to build your own. 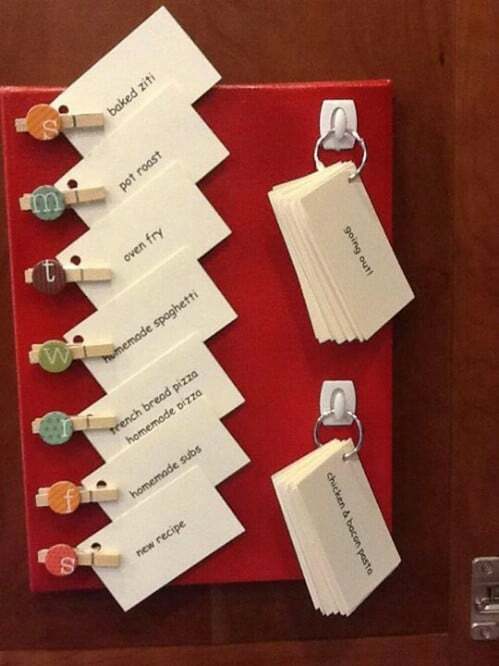 This is a great idea from Iron & Twine. It actually started as three Expedit shelving units from IKEA but when turned on its side, it offers a great storage and organization center that makes a perfect command station. 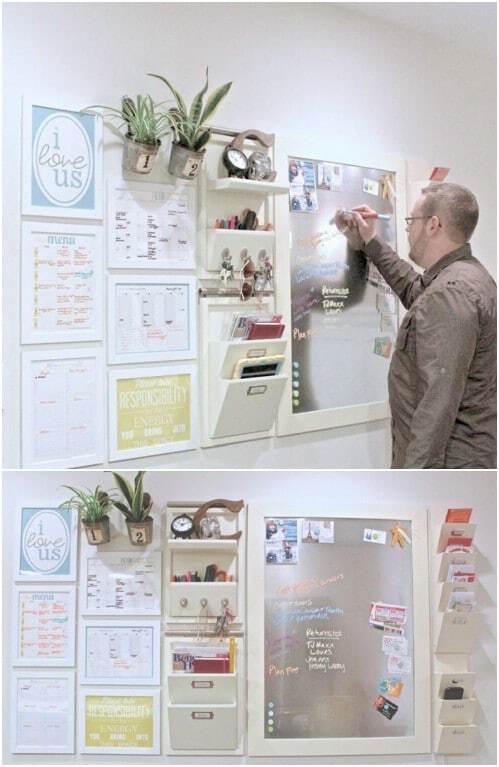 You can put everything that you need to keep handy in the shelves and it has a chalkboard on the end for messages. 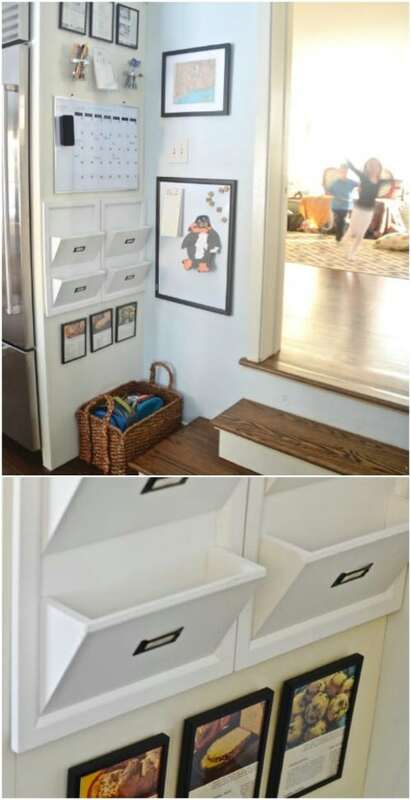 The shelves are the perfect size for keeping files and other things neatly put away and those organization baskets fit perfectly in the holes. 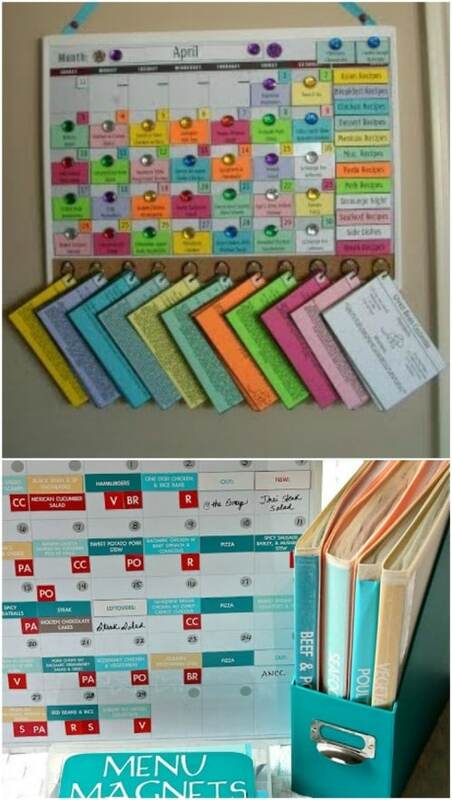 You know you need a bit more organization in your life and this is a great way to get it. Imagine the things that you can do when you think outside the box. 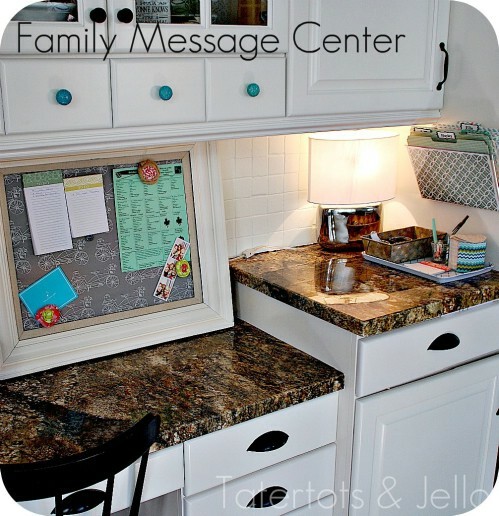 Conclusion: A Family Command Center Helps Your Household Stay Organized … And Inspired! As you can see, the role of a family command center ultimately goes far beyond organization. Yes, it can help you to save time and money, but it also brings everyone together. It helps family members work together to create a beautiful household and life together. It uplifts everybody and reminds them to cherish each day and find the joy in even the most mundane tasks, chores and responsibilities. I hope that these command center ideas have inspired you, and that you are ready to share that inspiration with your own family by creating a command center of your own! Where did you find the small black wire mail baskets? Can’t find them anywhere! Thanks!